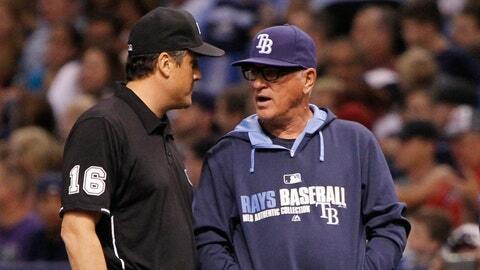 Through Thursday, Rays manager Joe Maddon is 2 for 4 on his challenges so far this season. Joe Maddon has done time in Wichita. He said as much in late March, during spring training, when he chose the Kansas community as the Tampa Bay Rays’ code word to signal that a call should be challenged as part of Major League Baseball’s expanded replay. The moment was vintage Maddon: funny, creative, smart. He’s one of a kind. Why let Omaha, made famous by quarterback Peyton Manning’s audibles last fall with the Denver Broncos, have all the fun? Why not pass the love to another Midwestern city? "Omaha and Wichita, kind of almost in a perverse way, rhyme," the manager said last month. "I never served time in Omaha, but I have in Wichita." Wichita had quite a run with the Rays to start this season. Maddon won his first challenge on Friday, April 4, when Wil Myers’ diving catch of a ball from the Texas Rangers’ J.P. Arencibia in right field during the seventh inning was first ruled a single. Maddon won another the next day, when shortstop Yunel Escobar’s throw to first base to retire the Rangers’ Robinson Chirinos in the second inning was first ruled too late. But Maddon lost one apiece the next two days — Monday and Tuesday — when his winning streak ended against the Kansas City Royals at Kauffman Stadium. Still, Wichita has become part of the fabric of this Rays season. The label is a nod to Kansas’ largest city, with a population of about 382,000 people. It’s known as the "Air Capital of the World" because of its background in aircraft manufacturing. Its sports ties are a mix of Royals and Kansas City Chiefs love, with college allegiances to Kansas, Kansas State and Wichita State sprinkled about its Old Town district and elsewhere. Its Shockers were the first team in college basketball history to go 35-0. Its passions vary like any metro area: Arts, culture, entertainment. But baseball is an interest that has owned a soft spot throughout Wichita’s history. 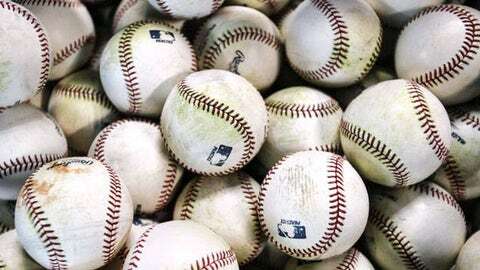 "Maybe that’s why Wichita is his call sign, his code," said Josh Robertson, president/general manager of the Wichita Wingnuts, part of the American Association of Independent Professional Baseball. "He’s got a warm place in his heart for it." Robertson would know. He also serves as general manager of the National Baseball Congress. The NBC World Series is held each summer at Lawrence-Dumont Stadium near downtown. It has grown into one of the country’s most storied amateur tournaments since its start in 1935, when Satchel Paige’s team from Bismarck, ND, won the title. It has a proud past. Maddon participated as a member of the champion Boulder (Colo.) Collegians in 1975. He returned as a player-coach in 1980. He was inducted into the NBC Hall of Fame in 2012, joining others like Barry Bonds, Buck O’Neil and Ozzie Smith to receive the honor since the inaugural class in 1991. So Maddon has served time in Wichita, all right. Some Wichitans see themselves in him. They are proud people. "I kind of think of Wichita State as a perennial underdog," said Steve Shaad, former general manager of the now-defunct Double-A Wichita Wranglers. "With his managing background and not a lot of success in the minor leagues and coming into the big leagues, he wasn’t really successful as a player. "But he has managed to persevere and be extremely successful as a major-league manager. I think he’s a kind of a roll-up-your-sleeves, get-hard-to-work kind of guy that overcomes obstacles. I think Wichitans, as a whole, can relate to that." This has been quite the year for Wichita. The Shockers’ run under coach Gregg Marshall nudged the city from the shadows of Kansas City to the northeast and Dallas and Oklahoma City to the south. Now, Wichita is known for more than the site of the original Pizza Hut and a convenient place to stop on a drive to the Rocky Mountains. But for many years, baseball has remained a pride point within this city nestled on the Arkansas River. Per Baseball-Reference.com, Wichita has been home to some form of minor-league baseball since 1887. Wichita State grew into one of the country’s best programs under manager Gene Stephenson after his arrival in spring 1977, with seven College World Series berths and a national championship in 1989. Future major-league stars like Carlos Beltran and Johnny Damon, a former Rays member, played in a combined 161 games with the Wranglers in the late 1990s and early 2000s as part of the Royals organization. If only the stands at Lawrence-Dumont Stadium could talk. So Maddon’s nod to Wichita fits. It’s a tip of the cap to his past. For Wichitans, it’s another reason to brag about their present. A bond has formed between the nation’s breadbasket and Florida’s Bay Area. "Knowing that Mr. Maddon grew up as a Cardinals fan, he’s obviously a very smart fellow," said Ted Ayres, vice present and general counsel at Wichita State, and a die-hard St. Louis Cardinals fan. "And I think he’s a sports fan if he’s showing respect to Peyton Manning and his career as a quarterback. I’d also like to think the performance of the men’s basketball team here, the Shockers, this year — going 35-0 before finally being defeated — must have caught his attention. "So it’s only natural that he’d want to be associated with a winner like Wichita." That’s the interesting thing about Maddon. You never know what you’ll find around him. From DJs to penguins to pythons in the clubhouse to a 40-foot RV at spring training to feeding the homeless during his "Thanksmas" celebration each winter, he’s a renaissance man. Life is his playground. The unpredictability makes him entertaining. The variety makes him insightful. Now, Wichita is part of his tapestry. "I like watching the guy manage — him with his glasses on," Robertson said. "He’s got that old-school, hard-nosed, blue-collar-type manager (approach). He gets the most out of his players. From what I can see, and the things that I have heard … he’s old-school, blue-collar, respectable, that type of guy who gets everything out of his players. "And obviously, Wichita has got a place in his heart." The beat will live with each Rays’ replay challenge this season.